Long-time HawaiiUP listener Adam Eakins in Grapevine, Texas, and his wife Bridget welcomed a baby daughter into the world on Tuesday. In addition to having the best birthdate ever, she got a great name: Katie! 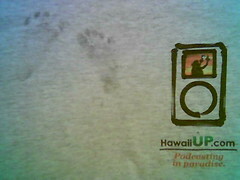 Adam passed along the above photo, wherein baby Katie turned a HawaiiUP T-shirt into a priceless memento. Read more about Katie’s arrival on their blogs at GreatWhitePaw.com. While obviously I’m failing miserably at keeping up the podcast, the friends I’ve made through the show continue to inspire and encourage me. Congratulations, Adam, and thanks everyone, for checking in, keeping in touch, and living the aloha spirit.